JoshLyons explains that pre-cues give two important benefits: 1) the horse becomes lighter and 2) the horse becomes less aggravated. Josh said that horses become aggravated when asked to perform the same movement repeatedly with a strong cue. This repetition, without change, causes the horse's aggravation. Training with pre-cues allows you to add that element of change into the exercise. As the horse works to determine the sequence of pre-cues, he learns that he can respond with fewer direct cues. 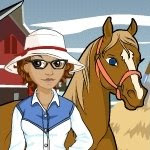 This focuses the horse's attention on the learning sequence and reduces his frustration level. Using pre-cues will also make you a better rider. Because you become more conscious of your actions, you will become more consistent and more precise in using your body. These changes will improve your ability to communicate with your horse. Can a horse be trained to respond to soft cues, when a rider is currently using spurs and a heavy bit to cue his horse? Certainly. Horses can be taught anything if the owner is willing. To encourage your horse to become lighter and more responsive, allow your horse to have the choice of picking a softer cue pressure. The softer cue pressure you are offering to your horse is called a pre-cue. Once your horse chooses the precue over the normal cue pressure, the pre-cue becomes the normal cue pressure and another precue should be offered. This cycle will continue forever. Horses will also send pre-cues to warn riders about what they are planning to do. A rider who is not aware of the pre-cues will often say, "Suddenly my horse just started bucking." Horses do not just start bucking--they send pre-cues that they are going to start bucking. A horse dropping his head can be a pre-cue to bucking. A horse moving his weight from the hindquarters to the forehand can be a pre-cue to him dropping his head to prepare to buck. When riders take notice of these pre-cues which horses offer, they can correct an action long before it becomes a problem. To succeed in any training goal, rules must be set and followed. The main rule all horses must obey is that they must move away from pressure. The rule riders must obey is that when a horse moves away from pressure, pressure must be released. When these two rules are applied correctly, your horse will willingly begin to avoid pressure. The rule that horses should avoid pressure is the more advanced form of the rule that horses move away from pressure. Horses learn to avoid pressure by looking for a pre-cue to a rider's main cue. A pre-cue is generally a movement a rider makes while preparing for a cue. When a horse tried to avoid your cue by responding to a pre-cue, you should not correct him. Instead, reward him by stopping your cue pressure. One of a rider's many goals is to achieve lighter and more responsive cues, so horse and rider can move in harmony. Imagine cueing your horse by just turning and looking in the direction you want to go, as in, "Look ma, no reins or legs!" This soft cue can be encouraged by always beginning with a pre-cue before the cue you normally use. For example, when turning your horse to the right, begin by turning your body and increase the cue pressure until your horse obeys. Soon, your horse will choose a precue somewhere along the increasing pressure. The point where your horse responds will become the new cue pressure for your procedure. This system will continue to the point where you will only need to look and move your body in the direction you want. When your horse is trying to avoid pressure, your cue movement will be undetectable to others. It will be undetectable because you and your horse are moving = simultaneously through the procedure. WHY WOULD A HORSE WANT TO AVOID PRESSURE? When a horse is trying to avoid pressure, he is doing it because the pressure of the cue bothers him. So, the horse begins to look for a sign to avoid the pressure entirely. When correcting a horse for avoiding pressure, you are telling him to accept pressure, or to ignore pressure altogether. This breaks the most important rule of communication, that horses should move away or avoid pressure. A rider who breaks these rules is a poor leader. Horses lose respect and trust in riders when they contradict themselves. For communication to work, each rule and procedure must have a definition. This way when both horse and rider learn the rules and procedures, they will have guidelines to follow. By having guidelines, a rider does not have to explain every detail; the guidelines will fill in the blanks. In this case, the guideline is that horses must avoid pressure and work together with their riders. Wouldn't it be great if your horse would respond to pre-cues? Why is this so hard to achieve when it is such a natural response for your horse? Again, poor communication is to blame. 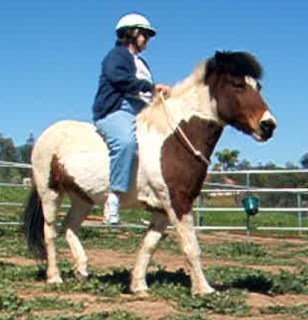 Many riders will punish their horses for trying to anticipate their movements. These riders may think their horse is being difficult, that he should not respond until the cue is given. What the riders are really doing is punishing their horses for looking for a pre-cue to avoid the pressure of the cue. For example, if it normally takes five pounds of bit pressure to stop your horse, then one day your horse responds to a pre-cue at two pounds of pressure by stopping five feet short of your target, repeat the procedure with two pounds of bit pressure. The simples solution when your horse is responding to a pre-cue is, make the pre-cue the new cue. This cycle may continue to a level of response you could never have imagined. Here are two examples to help you decide the difference between a horse avoiding cue pressure and a horse making a decision on his own: If you have already decided to turn or stop your horse, and he beats your cue, he is trying to avoid pressure by responding to pre-cues. On the other hand, when your horse decides to turn or stop when you had not planned on doing so, your horse is anticipating or making his own decisions. At any point your horse purposely or mistakenly responds to a pre-cue, reward him by releasing the cue pressure. Soon you will find your horse making a game out of trying to find a softer pre-cue. Your horse taking the challenge of looking for pre-cues in a playful manner is a good sign, because your horse should enjoy working with yuo and training should be fun. It is much easier teaching horses when they enjoy working as opposed to the "or else" method. Riders may cause their own problems because they do not give pre-cues. An example is a rider who mounts his horse and quickly and sharply kicks his horse forward. The horse, trying to avoid the kick, begins moving forward before the rider is in the saddle. The rider sees this action as a bad habit instead of seeing the horse trying to avoid being hurt while doing as he is told. To avoid this, use a softer cue, and vary the length of time you stand still and when you apply your cue. Simply be aware what movements or signs may be pre-cueing your horse. Remember, horses are trained to obey humans, so be careful what you are saying. When you are learning to communicate to your horse, you may unknowingly miscommunicate. Horses always offer pre-cues before an action. This is why I say, "Northing just happens; it has been growing unnoticed for a long time." A good rider can trace a horse's pre-cue path all the way back to a tense mouth or stiff ears. Tracing the pre-cues back is important, because a rider does not have to wait until the horse is bucking to correct him. Horses can be corrected for preparing or just thinking about bucking. When a rider waits for the bucking, the correction will need to equal or exceed the violence of a buck. Correcting a horse for thinking about bucking may only amount to a simple hand movement cue, to relax. A simple hand movement is much safer than correcting during a buck. Every horse will have a different pre-cue to their actions. There are many standard pre-cues horses will follow due to their physical build and instinctive responses. Still, there are too many pre-cues and too many actions to list in this article. The better you understand how a horse thinks and responds, the better you can identify pre-cues before the actions. Naturally it is always better to avoid a problem from happening than correcting it later. An action from a horse can also turn into a pre-cue when it is not corrected. By not correcting or noticing a horse's action, the rider is saying it is o.k. to act in this manner. So, the horse continues with the same action at a higher level each time until the rider notices. In other words, until it becomes a "problem". For example, you may begin by having trouble catching your horse. Then you start losing control while leading him to the tack room. Both problems have lack of respect at the common cause. Here the pre-cues for lack of respect are at different levels. The lack of respect started in the stall and grew to being displayed while being led. Unless it is corrected, it is only a matter of time before the problem is displayed during riding. Horses will talk to us if we pay attention and listen to what they are saying. At first, your knowledge of horse language may just be saying "yes" or "no". The more you learn about horses, the better you can communicate with your horse. Pre-cues are just one of many different ways to tell your horse what to do. By using pre-cues before all your cues, you will inform your horse what you are preparing to do. Most importantly, you will be offering your horse the choice between responding to normal cue pressure or to a softer cue. When you keep your horse's interests in mind, you will gain his respect and trust. Without respect and trust, you will never become your horse's leader or friend. By achieving soft, responsive cues and by reading your horse's pre-cues to his actions, you can head off and correct your horse's actions without anyone even noticing. What would you say is the pre-cue for some of the common movements, such as transitions or lateral movements? I agree it's important to give a horse a heads up that you're going to be asking something and most dressage coaches will say that's a half halt. Is this what you're alluding at or something else entirely? A good post, it's important to give a horse a heads up that you're going to be asking something and most dressage coaches will say that's a half halt. Teaching a Horse to Talk - Listen very carefully to hear the horses "talking". As they learn, they will get louder; this is just the start. Misty, In Alaska, With Her Icelandic Horse - Misty and her Icelandic Horse, in Alaska, plowing through a snow drift. Carolyn Resnick Method and Icelandic Horses - This video shows use of the Carolyn Resnick Method with an Icelandic Horse.